Het appartement beschikt over een ruime open lounge met een op internet gebaseerd tv-systeem (met Britse zenders), een smart droid-box met UK TV plus up-to-date films en 7-daagse weergave, eigen supersnelle wifi, flatscreen-tv, dvd speler en hifi-systeem, een grote zithoek met twee grote banken, een eettafel met 4 stoelen en een keuken met inductiekookplaat, oven, grote koelkast met vriesvak en magnetron. Slaapkamer 1 is voorzien van twee eenpersoonsbedden, volledig ingerichte kasten met integraal badmeubel en onafhankelijke airconditioning. Slaapkamer 2 is voorzien van een kingsize dubbel (nieuwe matras oktober 2017), volledig ingerichte kasten met integraal badmeubel en onafhankelijke airconditioning, deze kamer profiteert ook van Franse deuren naar het zonneterras. De loungeruimte is voorzien van airconditioning voor maximaal comfort en grote tuindeuren naar het balkon. De badkamer is geheel betegeld en voorzien van een bad en douche. Dit geweldige appartement is smaakvol ingericht en is zeer goed uitgerust naar een hoge standaard voor zowel gezinnen als stelletjes. Er is een reiswieg in het appartement als u reist met kinderen die nog steeds een kinderbedje nodig hebben. We vragen alleen dat u uw eigen beddengoed meeneemt. Als je iets nodig hebt voor baby's terwijl je op Cyprus bent, zoals speelgoed, sterilisator voor flessen, flessen, kinderwagens, autostoelen als je ze niet hebt gehuurd van de autoverhuur, springkussens voor baby's, deze kunnen bij ons worden gehuurd en in het appartement voor u voor uw aankomst gewoon vragen. Er is ook een stoelverhoger voor peuters om aan tafel te zitten en te eten. Als u een kinderstoel nodig heeft, kunt u deze ook huren. Laat het me weten. Er is ook een barbecue op het balkon die u kunt gebruiken. Het is perfect gelegen op slechts 20 minuten loopafstand van de zandstranden, winkels, de haven en het toeristische hart van Kato Paphos, dat vele bars, pubs, restaurants en nachtleven voor alle leeftijden heeft. Als u een welkomstpakket in het appartement wilt hebben om in het appartement te zijn, laat het ons dan weten op het moment van boeken of zo snel mogelijk, zodat we dit voor u kunnen regelen. Hiervoor wordt een toeslag berekend en ik kan dit op elk gewenst moment aan uw factuur toevoegen. We had a good stay at this place. The appartment was very cosy and had everything you needed. The city-centre is quite far away, so don't stay here if you want to be out in the centre/at the beach all day. The bus-stop is close by and there is enough parking space here. The bed's are quite old and were not comfortable. out of the 3 beds, only one was sort of good enough for my sore back. The appartment has a swimmin-pool close by. Make sure when you go here to visit Tasty! they serve the best cyprus fastfood! Lovely flat, with everything that you need. Good bus service near by, which we needed to get about. Perfect place if you have a rental car for exploring Cyprus, as there was plenty of parking in and around the complex. We chose this accommodation because the beach could be reached on foot in 10 minutes. The distance to the beach is not within 10 minutes walk to reach rather 30 minutes at least. Everything else was as described. Sofa and mattresses were worn, but due to the price for the apartment still okay. Just to confirm the beach is with in 10-15 minutes walk of the apartment. Obviously this does depend on how fast you walk and also what part of the beech you go to. The mattresses are not warn as one of them was replaced just over a year ago and these are checked regularly. So if they are worn we can replace them. The sofas are not worn either. These are fine too. They are not collapsed and are perfectly fine. I do disagree with the review and the amount of stars you have given the apartment. Firstly, many thanks to Beverley who answered all of our questions so promptly, from our first enquiry, to little questions when we were at the property. There is also a local contact, Max, who proactively contacted us to introduce himself and to make sure everything was ok. 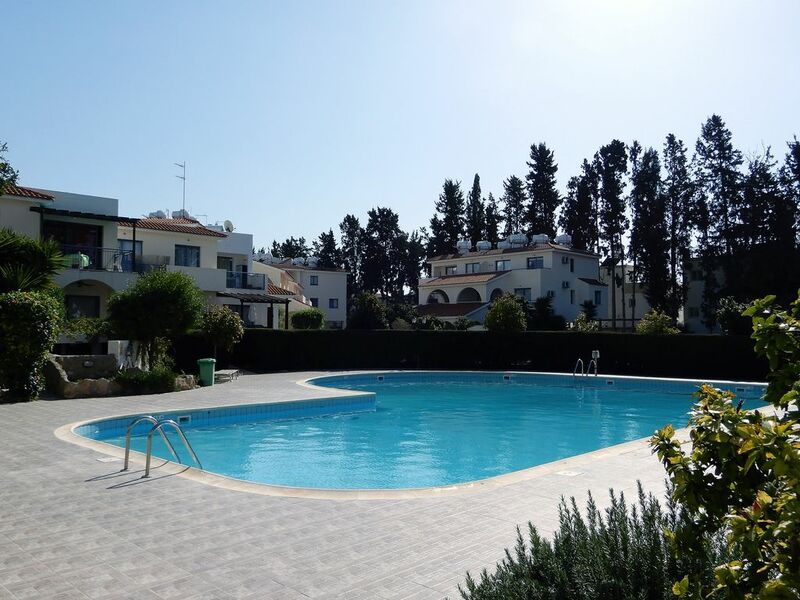 The apartment was immaculately clean and is exactly as shown in the photos (apart from there is actually a new washing machine which was great, we took only hand luggage for the week as we knew that we could wash halfway through the holiday). The kitchen has a proper fridge/freezer which was a bonus, as normally I find only a fridge with ice box which is no good for keeping ice creams etc. properly frozen. The pool was too cold to use in mid Feb, but it was clean and there are sun loungers there to use. We actually swam in the sea as it was surprisingly warm and my daughter had a great time. We had a hire car, but even so, we walked from the apartment into Paphos old town and harbour area a couple of times, and the beaches just south of Paphos. Probably about 20 mins to the town and 15 to the beach. I use Homeaway a lot and always have confidence booking a property that has plenty of positive feedback and I certainly wasn't let down this time. Thanks again for letting us stay in your lovely apartment, and the late check out. Thank you so much for your great feedback. Nice to hear you had a great holiday and you walked into the town. We hope to have you as guests again. Sehr schönes Apartement! Groß+sauber, prima Lage!!! Firstly Bev & Stephens communication from the start to end of the booking/holiday is great and dealt with any questions I had straight away. We have just returned from a amazing week at this apartment.2 adults,2 teens and a 11yr old. It’s a 20 min taxis ride from airport. Everything you could want for self catering is catered for in the apartment. Spacious & lovely decorated. There is also a pool just next to the apartment. The local people in the area are all welcoming. The location is a 5 min walk from Pambis restaurant & 2 grocery shops. I would highly recommend you visit here the food& people are amazing. It is a 20 min walk to sea front/bars/restaurants/shops, harbour 30 mins but that was fine with us as we love walking and looking about. 1 day we walked 10 miles all around the old lighthouse beach which was beautiful.we also did the mountain tour which was WOW and so many stop off points that will. Low your breathe away and a tour of the island we booked through Stevies taxis for €180 euros. These were amazing days out and was blessed with great weather(these days). Temp was a average of 13-16° Dec 26-3rd jan but did get chilly in the evenings. We are definitely going to be booking the apartment again. Thank you for letting us stay. Thank you so much for your lovely review. Glad you enjoyed your stay at the apartment. The trip round the Island sounded amazing.